It has begun! Now, the savvy among you may be looking at that cool calendar graphic and wondering if I spent the whole day creating it, rather than writing. To you, I can proudly say that I stayed up late to finish it last night so I’d have the whole day free today. 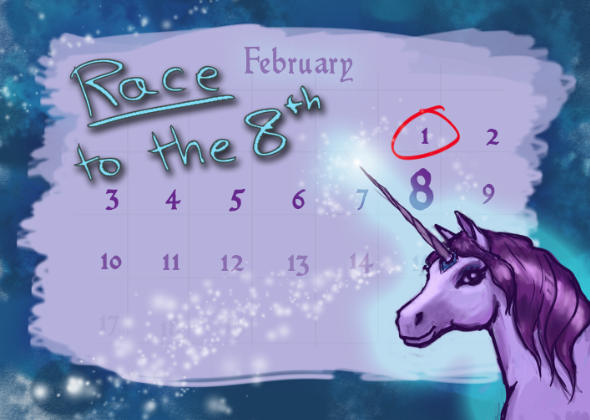 More of you might be wondering what is up with the unicorn and the sparkles. Well, did I mention we’re doing this whole thing because the 8th is my birthday? My birthday has always been about unicorns and sparkles. That’s just how it is. Well, today was not perfect. I was tired, headachey, and dealing with all sorts of cravings for all the foods I’m not eating. I was not in any way immune to the distractions of the internet, or to the temptation to check and see if I had any new contest entries every five minutes (I didn’t). Still, I did okay. I made a good start. I’m proud of myself. Today, I completed my revision of Chapter Nine: To the Wolves. Admittedly I’ve been working on this chapter since, god, since Christmas, but I’ve been working on it so long because it’s tricky. There’s this one part I finally polished off today where I’m writing about one thing and trying to reference this other thing, but it has to be done without looking like I’m referencing the other thing, and without being too obvious. This is what I meant when I said my progress reports wouldn’t make much sense to you. But hey, Chapter Nine down. Tomorrow I can move on to Chapter 10. In total, there are 12 chapters and an epilogue. Seven more days. This might be doable. There are, of course, still a few clean-up matters to attend to in the earlier chapters, and I’m just now considering ANOTHER re-write of my opening pages, but still. We’re moving along. Tackling Swamp Times (Chapter 10) tomorrow! before we announce the winner, because it is too good not to share. I had a series of interesting dreams this morning. In one of them, I found my soul mate at a very dodgy, second rate carnival in Michigan. I know it was second rate because they wouldn’t stop the ferris wheel even though I was CLEARLY only holding on by one hand and about to fall to my death. I found him (my soul mate, who was someone I had never seen before in my life) just outside the paintball room/funhouse. We were both so surprised :). In my next dream, however, I was back in Maine and in the same house as a serial killer. You will be happy to know that I did the right thing, and set Beyoncé free. My own fate was still up in the air, however, so it’s good I woke up when I did! And now, the part you’ve all been waiting for. I realized pretty quickly that I wanted EVERYONE to win, so we’re doing this by a totally random draw. I’ve got names in a container beside me at my desk. I like the noise they make when I shake them. I NEED MORE NAMES, PEOPLE! Entries are still open. Okay. Drawing a name now. Elise’s entry: Rewrite one of your favorite (or most hated) scenes from the perspective of another character or onlooker. Conveniently, I have this scene illustrated, although there is not actually a streetlamp in evidence in this picture. The street lamp at the corner of Baker and Fifth* was uncomfortable. It was uncomfortable because there was a person standing underneath it. Not that the streetlamp was unaccustomed to humanity passing by on the sidewalk below; it was just, that, well, they usually passed by, and didn’t camp out holding a sign for several hours. Actually, this little bit of humanity had been there even longer. It had first showed up when the streetlamp was still lit, a good bit past the point when the late hours of the night transitioned into the early hours of the morning. It had stumbled down the street from the direction of the tavern on 7th, and had curled up in the lee of the steps of the print shop. It slept until the streetlight followed its program and shut itself off, and until other passers-by made noise and got on with their business of passing by. Then it—which the streetlamp supposed was a boy, or a young man, even though it had long blonde hair like a girl—had woken up, looked miserable, and sat in the grass for a long while. He was carrying a few heavy bundles, though he didn’t open them. Go on, thought the streetlamp. Go get breakfast. I bet you had a hard night. But you can make today better. Go on, move along. The boy just sat there. It was infuriating. Finally he stood up and picked up his bundles. Alright, thought the street lamp. Now you’re getting it. But instead of walking down the road, the boy went into the print shop. The streetlamp couldn’t hear anything that happened in there, but the boy came out carrying a sheet of paper with something written on it. And then he proceeded to stand underneath the street lamp, just stand there, holding that sign. The streetlamp wasn’t used to this kind of treatment. This wasn’t one of those neighborhoods. They didn’t even get much homeless here, and what they got usually preferred the other side of the street. So what was up with this kid, and why here, of all places? And why did he look so sad? And what did it say on that sign? The streetlamp waited over an hour to find out. The whole time, the kid barely moved. A few cars slowed down as they went past him, presumably to read the sign, but they sped along quickly. Finally, a blue ford pickup truck came down the road. The ’92 model, unless the streetlamp was mistaken. The pickup truck slowed down. The street lamp would have held held its breath, if it could breathe. Then—yes, the pickup truck stopped. The boy let his sign flutter to the ground, and put one of his bundles in the truckbed before climbing into the passenger side and closing the door. The truck drove away. The street lamp looked down, and saw that the kid’s sign had landed face-up. 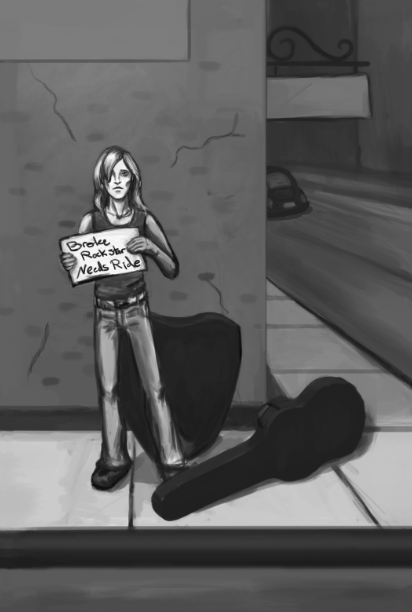 The streetlamp could just make it out: “Broke Rock Star Needs Ride.” Huh, thought the streetlamp. Glad he found what he was looking for. And then the street lamp got on with its daily business, entirely oblivious to the fact that it had just witnessed the beginning of a grand adventure. I will see you all tomorrow. Happy Writing. *Totally fictional street names because I never bothered to research actual neighborhoods of Boston. Also, those dreams seemed amazing and terrible, in that order. Also also, I love sparkles and unicorns, and that calendar is BOSS.